Another time pictures saved my life. My knee [had] swollen to the size of a melon and I was lying in a hospital. Such despair. How to recover and then cope with the mountain of medical paperwork? In a fever the idea emerged swimming in heat. ‘I will do as people have done for centuries – seek restoration as a pilgrim.’ Blue History is a record of that walk to Santiago twelve years ago. I used a staff – I am not young. It transformed the conceptual scale of my work from single images to step-by-step series of panoramas that now stretch to hundreds of feet of paintings, drawings, and prints. 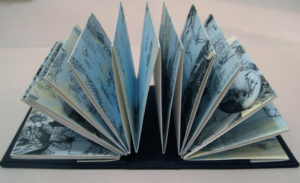 The books are often small and intimate, say 4 x 6 inches, easy to hold in the hand. Then, on opening one up – slowly, carefully – they can extend to as long as 10 feet. To show you how this works we present three of her pieces. For each, you will see stills followed by an image you can manipulate as slowly as you would if you were exploring the physical book. Breathtaking. 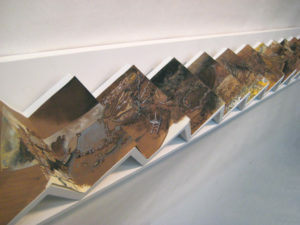 Margin and Scree, 2011, Edition 8. 5.5 x 3” Closed, 5.5 x 10 feet opened. Archival ink jet print on rag paper. Bound in ochre silk removable covers. Clerk of the Carpet, Edition 6.
closed 5.75 x 4 x 1″, opened 5.75 x 110″. Blue History, 5.5. x 3” closed 5.5 x 10 feet opened. 2008. Edition 8. Archival ink jet print on rag paper. Bound in removable black silk covers. 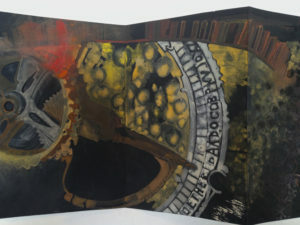 Ellen Wiener frequently collaborates with poets – her images have appeared on over a dozen book covers. 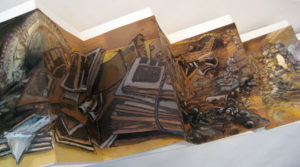 Currently her books can be seen at The Center for Book Arts and Central Booking Gallery in New York. 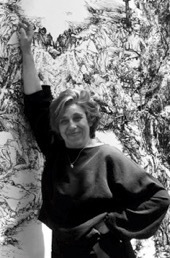 A professor of visual arts since 1985, she has taught at Princeton, Dartmouth, Queens CUNY and, most recently, SUNY Stony Brook. Her work has been exhibited at museums, galleries, and libraries nationwide. She is the manager of The Ink Hotel, a working-retreat house for writers and artists on the North Fork of Long Island. Contact her on her website: ellenwiener.com. View More: Next piece "Poems from the Central States", Home, Archive. Thats it: bold gold gorgeous! A glad adventure to travel her book ? by ways! Thank you for great art! These look amazing. I wish we could click on them to enlarge to see more detail. 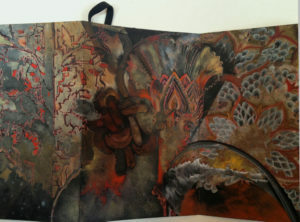 Having seen Ellen’s art books in person .. I find them simply magical- small colorful jewels that spread their wings into stunning visual journeys. Ellen is a beautiful person whose work is masterful, unique and beautiful.